Find classic white floor register in 11 sizes from 2.25 x 10 up to 6 x 14. Brown vent covers in a classic style and color. 11 popular sizes available starting at 2 x 10 up to 6 x 14. This brilliantly plated polished brass floor register is made with a steel faceplate! It also has a no rust, plastic adjustable damper. Simply drop the decorative vent cover into floor opening and installation is done. Buy these satin nickel floor registers today and brighten up your floors. Sturdy and affordable, this decorative vent cover is made out of plated steel. The faceplate is coated in a preventative lacquer to stop corrosion. Rich in color, these oil rubbed bronze registers are powder coated to protect the finish. Able to hold up to 200lbs, this sturdy decorative vent cover is a must have for any room. Try them out now! Our floor vent cover is a Marquis decorative design that will look great in your home. Finished in a beautiful satin nickel, this steel faceplate is made to last. Order today to ship straight to your door. Available in three sizes, this Marquis floor register is beautifully plated in a pewter finish. Order this decorative vent now and control your air flow with style. This white vent cover is made completely out of plastic, so it will not rust. The damper on this plastic air diffuser is adjustable, allowing you control of the airflow. Swap out rusted metal registers for these today! Decorate your space with Victorian registers that are made out of a high-density plastic. These heat vent covers can hold around 300 lbs, making them a durable solution when looking to replace rusted vents. Look no further for a modern floor register that is affordable and durable. This plastic air vent cover will liven up any room with its satin nickel finish. Purchase them today to use at home or in the office! These contemporary and modern brass air vents are your chance to spruce up your home's style. The secret to these plastic registers is that they are made of a high-density resin, giving them the same durability as a metal register! Our antique brass plastic floor register has a fully adjustable damper so that you can control airflow in your home. Order them today and see how nicely this will blend in with any style. Our oak plastic vent covers are suitable to use in bathrooms and kitchens where moisture is present. Match your hardwood to this oak floor register and fool your friends and family! Try them today. Find basic baseboard diffusers in 15", 18", and 24" lengths. The sunburst design creates three way air deflection. Durable and decorative baseboard diffusers have a removable faceplate for easy maintenance and installation. Wicker style baseboard registers have an adjustable damper to easily control air flow. The plated antique brass finish is sure to bring warmth into any space. Easy to install baseboard returns can be yours for one low price! Made out of durable steel, these white metal air grilles have a 7/8" turnback depth on each side. These white return air grilles are made out of all steel and have a 5/16" depth to their side. Purchase your metal air vents in one large order to save on shipping! Click the link to see all 55 sizes listed. This 6" air return grille is circular in design and does not include a damper unit. Our round air vent comes in this traditional white finish and installs quickly. Ordering unfinished oak vent covers means you are able to stain them as you please! The durable 1/2" thick faceplate on these return air grilles ensures you are getting a quality product at a reasonable price. Purchase your wooden air vents with us today and have it shipped straight to your door! The air return grilles are stained in a light oak finish and will look great with other wooden accents. Classically simple, these white return air filter grilles will work on your walls and ceilings. The white vents had a latched frame which can be removed for cleaning or changing your air filter. Filter is sold separately. Durable wood register covers by Accord are made out of a red oak and are pre stained. The adjustable damper in the back is made from plastic so it won't rust! These wood vents offer a different option from the standard white registers. Hard-to-find satin nickel register in an attractive Charleston design. Trusted Accord floor vents feature an ABS resin plastic rust proof damper to control airflow. This decorative floor vent is available in sizes 4x10, 4x12, 4x14 and 6x10. Charlotte design Accord floor vents in a beautiful light oil rubbed bronze finish. Decorative floor register sold in sizes 4x10, 4x12, 4x14 and 6x10. Charleston floor register in an antique brass finish. 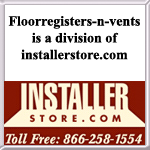 Durable decorative vent covers come with a non-rust plastic damper for air control. Sizes 4x10, 4x12, 4x14 and 6x10 available. Polished brass floor vents come with an adjustable drop in plastic damper. The Charleston floor register has a strong steel core and tarnish and corrosion resistant finish. This Accord Ventilation floor register is sold in sizes 4x10 and 4x12. Attactive black floor vents in a Charleston design. These decorative floor registers feature a rust-proof plastic drop in damper for air control. Accord registers available in sizes 4x10 and 4x12. Attractive Charleston floor register in the popular oil rubbed bronze finish. These decorative vent covers come with a fully adjustable rust-proof plastic damper. Find the sizes 4x10, 4x12, 4x14 and 6x10 sizes in this oil rubbed bronze floor register. Cathedral Accord Ventilation floor registers in an attractive satin nickel plated finish. This decorative metal floor vent is available in sizes 4x10, 4x12, 4x14 and 6x10. Cathedral decorative floor vents by Accord registers. These floor registers oil rubbed bronze light are sold in 4x10, 4x12, 4x14 and 6x10 sizes. Unique Charlotte geometic design floor registers in a beautiful satin nickel finish. This decorative floor register is available in 4x10, 4x12, 4x14 and 6x10 sizes.